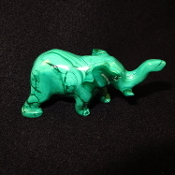 This Malachite Elephant measures 5 1/2 inches long and stands 5 inches tall. It weighs 3 Lbs. This item ships free anywhere in the continental USA. This Malachite Elephant weighs over 295 grams. It measures 3 3/4 inches long. This item ships free anywhere in the continental USA. This Malachite Elephant weighs over 131 grams. It measures 3 1/8 inches long. This item ships free anywhere in the continental USA. This Malachite Elephant weighs over 63 grams. It measures 2 1/4 inches long. This item ships free anywhere in the continental USA. This Malachite Elephant weighs over 363 grams. It measures 4 3/8 inches long. This item ships free anywhere in the continental USA. 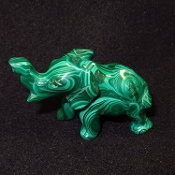 This Malachite Elephant weighs over 108 grams. It measures 2 1/2 inches long. This item ships free anywhere in the continental USA. This Malachite Elephant weighs over 193 grams. It measures 2 3/4 inches long. This item ships free anywhere in the continental USA. 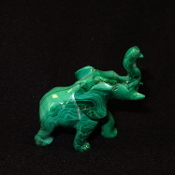 This Malachite Elephant weighs over 137 grams. It measures 2 3/4 inches long. This item ships free anywhere in the continental USA. This Malachite Elephant weighs over 91 grams. It measures 2 1/2 inches long. This item ships free anywhere in the continental USA. This Malachite Elephant weighs over 423 grams. It measures 3 3/4 inches long. This item ships free anywhere in the continental USA. This Malachite Elephant weighs over 107 grams. It measures 2 1/2 inches long. This item ships free anywhere in the continental USA. This Malachite Elephant weighs over 339 grams. It measures 3 1/2 inches long. This item ships free anywhere in the continental USA. This Malachite Elephant weighs over 147 grams. It measures 3 inches long. This item ships free anywhere in the continental USA. 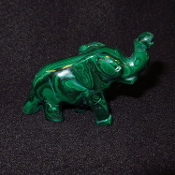 This Malachite Elephant weighs over 105 grams. It measures 2 3/4 inches long. This item ships free anywhere in the continental USA. This Malachite Elephant weighs over 123 grams. It measures 3 1/8 inches long. This item ships free anywhere in the continental USA. 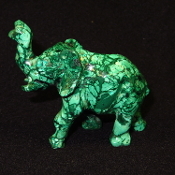 This Malachite Elephant weighs over 116 grams. It measures 3 inches long. This item ships free anywhere in the continental USA. This Malachite Elephant weighs over 247 grams. It measures 3 1/2 inches long. This item ships free anywhere in the continental USA. This Malachite Elephant weighs over 101 grams. It measures 2 3/4 inches long. This item ships free anywhere in the continental USA.